We got up at 5:15 AM in Bequia (see Grenadines Part II) and prepped for departure. We pulled anchor - literally, since we were using the spare anchor because of our broken windlass. At least we pulled anchor quietly and didn't disturb anyone. We expected light winds from the forecast, and as usual it was quite light in the morning. We had a pleasant motor halfway to Bequia, and then the winds started picking up. 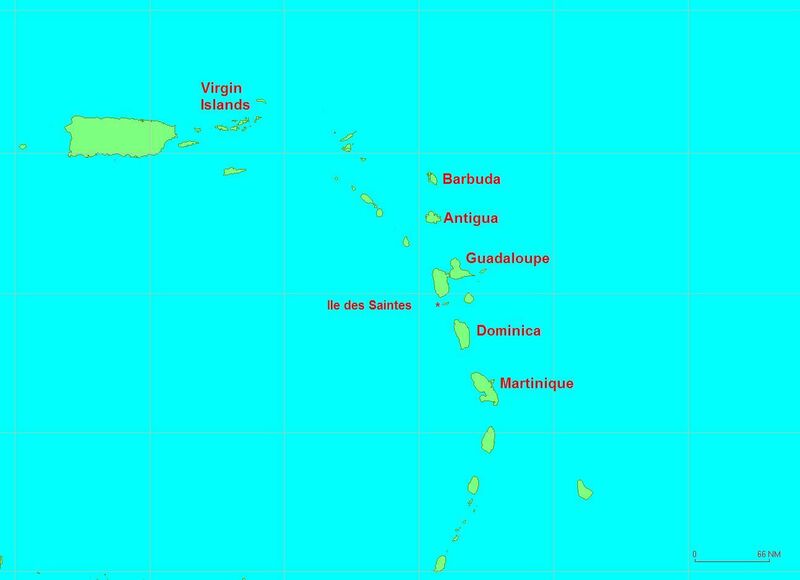 We ended up sailing until we got into the wind shadow of St. Vincent, then motored past St. Vincent. On the other side, the winds got quite brisk and we really picked up speed. Frank had forgotten about the northerly current and we were making 1 to 2 knots faster than expected. As a result, the 4:30 arrival we had been expecting turned out to be closer to 3:00 PM! When we got close to the Pitons (very unique rounded mountains on the south side of St. Lucia), it was near noon - so the girls got on Kidsnet. The girls found out Nosille was in Rodney Bay. So, we were quite excited to get to Rodney Bay and see our friends. Thanks to even faster current along St. Lucia, we arrived before 3 PM. As we were approaching, we saw at least 12 boats arriving from the north into Rodney Bay. The boats were heading south for the hurricane season. One was a large catamaran that looked familiar - it was Whilly Flippit (WF)! We were just taking a look with the binoculars when Stacy called us from WF. We dropped anchor and quickly got the dinghy down. The girls wanted to visit Nosille and WF. Scott from WF came over and took Frank and the broken anchor windlass ashore. Frank needed to see if the metal worker could quickly repair our windlass. It turns out they agreed to have it done by the next day - what luck! Frank and Scott then got cleared with customs. Meanwhile, Karen and the girls went and visited Nosille with the rest of WF's family. We all ended up going to the shopping mall to the grocery store there, and then eating at KFC for dinner. It was fun. Later, we went over to WF and the kids watched a movie while the parents played dominoes and Mad Gab. The next day we did some homeschooling, Frank did some boat engine maintenance, and we tried to do some shopping. Turns out it was a "holiday" - you won't believe this - the St. Lucia soccer team was playing an Australian team, so they declared it a national holiday so everyone could attend. There's a holiday for everything down here! Later in the day, Frank picked up the windlass which was done. It was a bit expensive, but not really bad considering the fast work. Frank and Karen went out to the boat and discovered our anchor had "dragged" a bit. Actually, it turned out the rode was wrapped around a large rock. Frank dove down and realized we needed to get to a less rocky area. While down there, he was stung a couple of times by jelly fish. We moved to another location with better holding, and Frank had to dive to check it again - more jelly fish. Ouch. We had one more chance to visit with our friends, so we finally resolved on some of us getting pizza. We were sad to have to say our Au revoirs, but we greatly enjoyed our time with Nosille and Willy Flippit. The next morning we left very early for a straight trip all the way to Antigua. 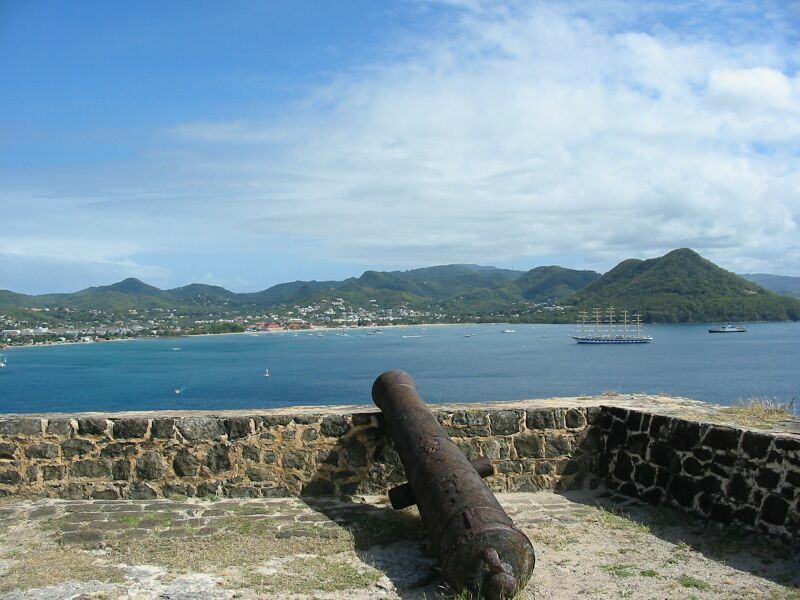 Read about the trip in Antigua Part IV. © Copyright 2002-2008 by Frank Taylor. All rights reserved.